In a stunning piece of engineering, the Linac Coherent Light Source at SLAC National Accelerator Laboratory has created X-ray laser light immediately after being switched on. 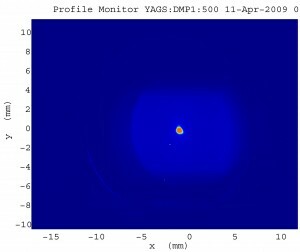 It is the first time that an X-ray laser has operated at such short wavelengths, with such brightness and short pulses. The laser paves the way to a new way of looking at not only the structure of matter but also its dynamics. By using laser pulses of less than 100 femtosecond duration, the dynamics of chemical reactions can be caught in process, and the machine promises to be able to image single molecules. The LCLS is based on the last kilometer of SLAC's linear accelerator, which was previously used to drive particle physics experiments but has been adapted to this new use. LCLS Construction Project Director John Galayda was clearly still shocked at how smoothly the turn on had gone, saying, "It worked so beautifully I just can't believe it...We were all just dumbfounded, standing there looking at the light." Initial goals for the LCLS were to switch it on and achieve laser light at a wavelength of 15 Angstroms, or 1.5 nanometers. Researchers would then attempt to tune the system to get the wavelength down to 1.5 Angstroms, or 0.15 nanometers, with the better resolving power they would provide. However, the laser immediately started working at the higher-energy, shorter wavelengths. Furthermore, the laser is achieving almost full saturation. That means all the laser power is going into creating laser-type photons rather than non-coherent photons which are still X-ray light but not with laser properties. That saturation was expected to take weeks or months of tuning to achieve. SLAC Director Persis Drell said, "I thought the first signs of lasing would be subtle. In fact, it was blasting. This is not shy, this is a very confident instrument." The LCLS is a free-electron laser that works by passing a high-energy electron beam through a series of undulators, which are magnets that bend the electron beam back and forth very rapidly, thereby causing the electrons to emit X-rays. The geometry of the system causes the X-rays produced to stimulate the emission of more X-rays, and it is that process which makes it a laser. However, this lasing process happens as the electrons and light travel in just one direction down the length of the machine, unlike conventional lasers which require a cavity for the light to bounce back and forth and build up the coherent, in-step photons that constitute a laser. Previous free-electron lasers have created light at other wavelengths including the ultraviolet and in low-energy "soft" X-rays. 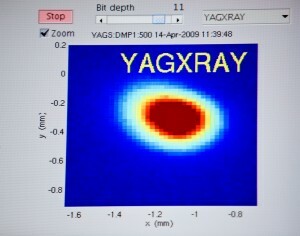 The LCLS has produced the first "hard" X-rays at such short wavelengths. 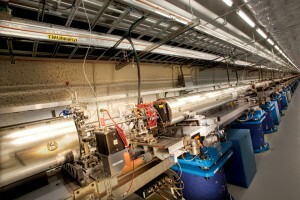 The LCLS will be further tuned as various experiments to understand the properties of this new type of laser commence. In coming months, the first instruments will be installed to use the X-rays to perform experiments on samples with a view to making images of single molecules, and start to explore the dynamics of chemical reactions. Further information in a press release, fact sheet, and video interview from SLAC.